This week Access All Areas members are being treated to a fantastic set of premium Photoshop Brushes from Vandelay Premier. This set of paper texture brushes is a great resource for adding detailed backgrounds to your designs or roughing up a design with subtle textures. The set features 10 texture brushes each at the maximum resolution of 2500px. 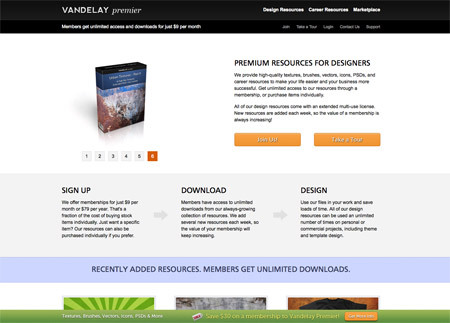 Vandelay Premier provide high-quality textures, brushes, vectors, icons, PSDs, and career resources to make your life easier and your business more successful. Their membership fee of just $9 makes for insane value for money with new resources being added weekly. This pack of high resolution paper brushes includes a range of different paper textures, from brown paper to wrinkled paper and light coloured textures to dark coloured textures. Anyone who has followed my tutorials here on Blog.SpoonGraphics will know how important subtle grunge textures are for roughing up and distressing a design, this set in particular does a fantastic job. Access All Areas members can download this premium brush pack, along with all the other members-only goodies as part of their ongoing membership. These are some sweet textures! Thanks Chris + Vandelay! I totally agree with you its a fantastic job. Paper textures are one of my favourites. do you can give me the your html ? How can i became a premium user?